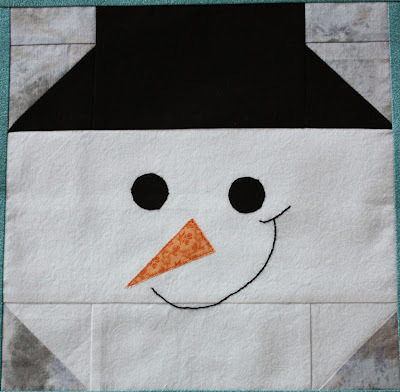 Devoted Quilter: Portrait of a Snowman and Giveaway Day! I am so excited today to announce I now have my very own Craftsy Pattern Store! 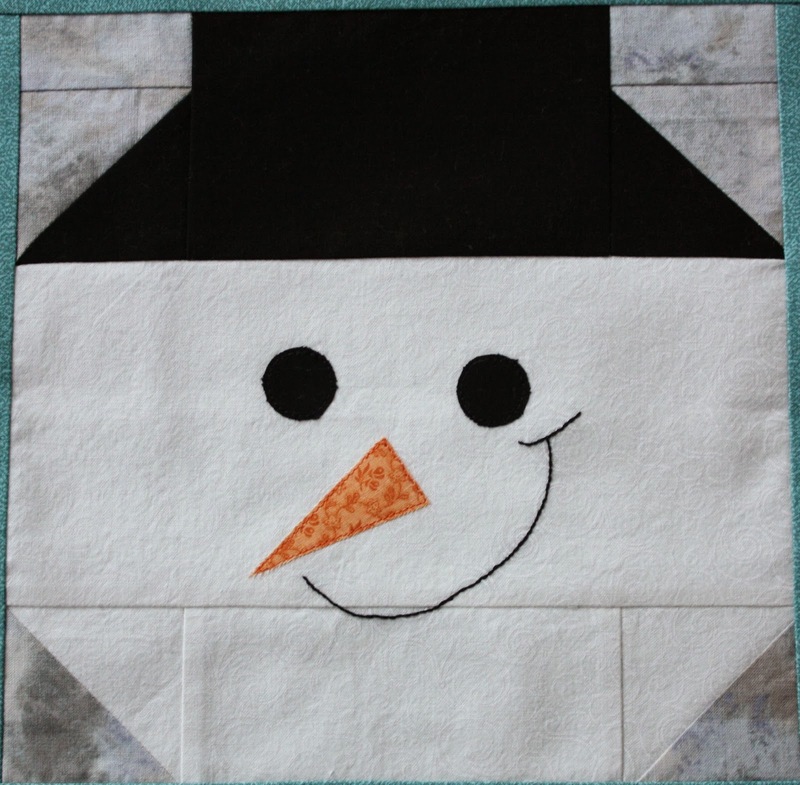 My first pattern is this adorable snowman portrait, aptly titled 'Portrait of a Snowman'. He is a 9" finished block done with simple piecing, applique and a little embroidery. My pattern tester, Annette, said this block woke her inner child. She had fun searching through her buttons to embellish her snowman. The eyes, nose and snowflakes are all buttons. Then she used a piece of ribbon to give him a bowtie. Doesn't he look dapper? In the process of writing the pattern, I made two snowmen, with the faces slightly different. I have each one made into a simple wall hanging, though the red one isn't quite finished yet. See how the changes to their noses and mouths change their whole personality? To celebrate the launch of my Pattern Store, I am linking with Sew Mama Sew's Giveaway Day. I am giving away one of my two wall hangings, and the winner gets to choose which one. The red one will be finished before the giveaway ends, I promise! This giveaway is open to anyone as I enjoy the thought of my quilts making their way to different parts of the world. To enter, leave a comment by Monday, December 16th telling me your favourite snow activity. If you don't get snow where you live, tell me what you think you would enjoy about snow. Followers get a second entry, just leave a second comment telling me how you follow. Make sure I can contact you if you win. There were a few no-reply comments during my last giveaway and I would hate to draw your number and have no way to let you know you won. I will draw the winner on December 17th. Updated to say I had missed the guidelines for the giveaway end date, so now I will be drawing my winner on Saturday the 14th. And while you're waiting to see if you won my snowman, don't forget to pop on over to my Craftsy store and purchase the pattern to make your own. He's quick enough you could still get a couple made as Christmas gifts! That is just so very cute! Thanks for the chance! So exciting to think of snow, since now we live in New Mexico and get two temps freezing and burning. We lived in Utah and Colorado for many years and have had our share of snow. My DH and I (once we became empty nesters) would book a hotel up in the mountain's and go hide till the snow was over. I remember once we had 5 foot coming our way, so we got off early Friday afternoon and ran for the hills of Blackhawk CO. We got snowed in of course but you could walk around the town without a problem. It was like we had the place to ourselves. We could hide and watch TV, or go to the pool it was wonderful time. We got home and had to clear 5 feet of snow to get into the driveway even, but it was so worth it. I don't like snow as much now that I am older. As a kid, we would spend hours at the local sledding hill, real fun. I have been following via email. Thanks for the giveaway. My favorite snow activity is making snowmen of course! Thes ea re really fun, thanks for a great giveaway. My favourite activites are building snowmen and going for family walks when the snow is deep and crisp. I wish we got snow! I'd love sliding downhill!AriadnefromGreece! We have 8 inches of snow now and could get up to another inch tonight. I love sledding and building snow animals with the kids. My favorite snow activity is building a nice fire, having a cup of tea and watching it from inside my house under a quilt. :D Thanks for the chance to win. Thanks so much! The snowman is really cute! My favorite snow activity is skiing. I love sledding with my kids. My favorite snow activity is going for a walk (especially in the moonlight) during a gentle snow fall. Oh these are adorable! I love helping the grand kids make a snowman, if and when we get enough of it! I love going for a hike in the snow! I love the blue one! My favorite snow activity is sitting inside drinking something warm, reading a book, while the snow stays outside! Ever so sweet! I love them! I love the snow and here in MI we get enough of it. I like so snowshoe! thank you! My favorite snow activity used to be building a snow fort. Now I stay inside where I'm warm and toasty and let everyone else play in the snow! I love the red one! I love to go sledding. Thanks for the chance. Your snowmen are lovely. My favourite snow activity is definitely building snowmen! So cute. I love snowmen, and the one with the bow tie really makes me smile. I like staying in where its warm & toasty & baking cookies! Ok I am probably showing my age here because I used to live for the first snow fall, now I like to curl up with a quilt hot cocoa and a book in a window seat and watch the snow come down outside. Your snowmen are adorable. Super cutte snowman. We do not get snow very often at all where I live. sometimes years go by without it. I do not like snow. So for me my favorite snow activity is staying inside drinking hot tea or coffee and trying not to have to go out in it at all. I love these snowmen! How adorable! My favorite snow activity is to sit inside with a mug of cocoa and watch the snow fall outside the window. We so rarely get snow but when we do it's simply the art of making a snowman. my favorite snow activity is to stay inside where it is warm. I like to watch the snow from by a cozy fireplace, though I would like to try snowshoeing. The snowmen are very cute! Mine is cross-country skiing, which I unfortunately haven't done in years! I love making snowmen with my two young boys. Cute! Sledding with my kids, followed by hot chocolate with mini marshmallows! I love watching the snow. I'm not big on being in it though. The snowmen are adorable. Thanks for the chance! I love to sled with my children in the snow. I'm not a fan of snow but I do enjoy the joy in my child's eyes when we build a snowman. He is wonderful - and yes, I love how the face changes depending on the smile and nose!!! Happy Wednesday to you!! I love your sweet snowmen. My favourite snow activity is watching our elderly dogs scamper around excitedly in the snow like puppies. They get it on their noses and sneeze a lot! I LOVE making snowmen and snow angels! Having so much fun passing these traditions on to my children! I love to make snow families. I love the variations of the snowmen! So stinking cute! My favorite snow activity is sitting inside all nice and warm and watching it thru the window. My favorite snow activity is sledding down the big hill behind our home. Now that I have a bad back due to an accident, I have to just enjoy watching the youngsters doing it. I follow you on Bloglovin and I do so love your wall hangings. Mr. Snowman is my favorite character of the season and you have brought out awesomeness in him! Super cute snowman. Great job and congratulations on your craftsy patterns. I love making a snowman in the snow and then coming in for hot chocolate. My favorite snow activity is staying warm inside, drinking hot tea and enjoying the snow out the window while I sew or read. My favorite snow activity is dancing in the flurries - all we really get in Texas ;) Cute pattern! I love to make snowballs with my daughter! I just love this wall hanging, sooo cute! What a great winter hanging- He would look so handsome on our school classroom door. My favorite snow activity- I love to see my school kids building snowmen and making snow angels. I am a new follower of your blog through email. I also have used Craftsy- I just bought a kit and fabric from them to make a wedding quilt and I have downloaded some patterns from there too. We don't often get snow here in England but I love to walk in it and throw a few snowballs! I just like watching it and taking a walk!! Cute Snowman!! Snowball fights + snow forts will always be my favorite! Cute cute snowmen. I particularly love the red one! My favorite snow activity as a kid was sleding down Art hill in fron of the famous Art Museum in St. Louis' Forest Park. We used inner tubes from cars, big cardboard boxes and sometimes piled 2-3 layers of people on top of each other for the exciting ride. Needless to say, not everyone was on the vessel by the time it reached the bottom of the long hill. Thanks for a chance to win. I like to cross country ski and I have a set of snowshoes for when the snow gets too deep. I love snow (except when it is still here in April or May!). My favorite snow activity is making snow angels! :-) I adore snowmen and want to thank you for your giveaway and the chance to win. I follow you via BlogLovin. Thank you for the additional entry. I must say that having a snowball fight with my family is my favorite snow activity, but living in the Memphis area, we rarely get enough to have one. Your snowman blocks are too cute. I think snowmen are so much fun because you have so many options to make their faces unique. Our favorite is snow tubing. I like watching my dogs play in the snow. They are crazy about the white stuff. I love walking my dog through the snow, he's a terrier and built for the cold! Absolutely love snowmen of all makes, models & forms! Great Block, a stitched up snowman. My favorite snow activity is cross country skiing in the mountains with friends! Thanks for the creativity!